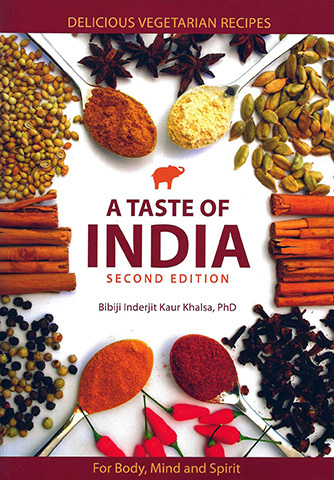 A Taste of India is the second edition of Bibiji's popular book on Indian cookery, inspired by her husband Yogi Bhajan. These recipes, based on the ancient Ayurvedic science of life, serve to nourish the entire being - body, mind and spirit. You will find among them recipes to uplift your soul and to open your heart. It is Bibiji's philosophy that the love you put into the food you make is the purist nourishment of all. You will discover many tips for preparing food at home, incorporating your healing touch and fulfilling your family's palate. In this book, great for yogis, exercise enthusiasts, martial artists, and anyone who wants to experience a boost in their metabolism and energize their whole being, Bibiji gives us colorful dishes that possess an amazing variety of subtle tastes and aromas. These recipes bring her special combination of herbs, oils and spices, with whole and natural foods, and leave you feeling uplifted and fulfilled. Add a little joy and spice to your life with A Taste of India.